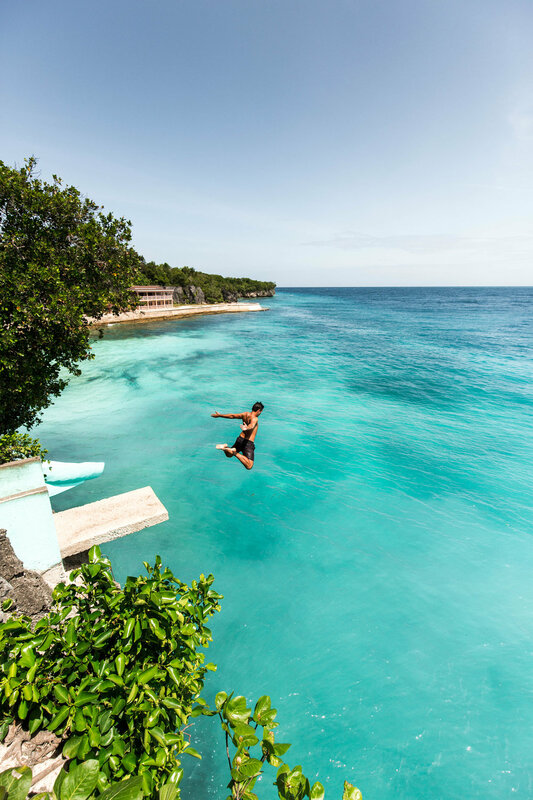 Siquijor, the second island we decided to visit, and boy am I glad we did! An extremely underrated island with so much natural beauty & mystery, you would be silly not to go. With little to no tourism here, I felt like I got real taste of what the Philippines and people were truely about. We spent our days exploring the contrast of beaches, swimming in vibrant waterfalls & riding around meeting locals and playing ball with the ever smiling kids. Originally we had plans to fly over to Siagoia island for the next 3 nights after Cebu, but we were unexpectedly faced with huge flying costs that were WAY out of our budget :(. I tell ya, getting around the Philippines is so much harder then you'll ever expect! If there is one piece of advise I hand on about travelling through this country is plan ahead! We mainly chose Siqiujor because it was close & accessible. From Cebu it is 2 short ferry rides from the town of Santander to Dumaguete, then to Siquijor. Santander is just south of Oslob, which you can catch the bus to for like $1. I cant remember the price of the ferry rides but I think it was close to $20. SO cheap! For the 4 nights we stayed, we found a little place on the island which we booked through Airbnb, Silka. It is a little far from all the main restaurants but is right on the beach front and was super comfortable and affordable. The ladies working there were soo nice and helpful :) giving us bowls, hot water and a knife to cook our oats and cut our mangos every morning. If you aren't too keen on hiring a bike or riding 40 mins to the main area I suggest for you to find somewhere else to stay :). The good thing about where we stayed was that it was a short ride to one of our favourite beaches on the island, Salagdoong Beach. Our first day on the island we rode to this beach & discovered some super sick cliff jump spots and a small white sand cove beach, surrounded by sparkling turquoise water. This beach is one of few that you have to pay to visit, as it is probably the most popular on the island. But its literally $0.50 which is the smallest price to pay for an amazing location. We ended up coming back here most days to cliff jump and sun bake :) If you are afraid of cliff jumping they have two levels you can jump from, but I recommend jumping the big one! Its the biggest adrenaline rush! Plus if you dont, all the local kiddies will show you up and jump off 10 times before you do haha. Playing with the kids and taking photos of them doing back flips into the water was such an incredible experience. Their laughter brings me so much joy! We finally found Cambuguhay Falls, which was some kind of lush jungle paradise. The surroundings here are incredible! And yes the water is that blue and the trees that green :). We spent the next couple of hours channeling our inner Tarzan, swinging from a rope above the waterfall and into the water. There are usually local kids hanging around the rope and asking for money to use the swing, which we paid. The kids were a lot of fun & would pull you high up before letting you go for a faster and funner ride. The falls are closed to public after 5 so be wary of that. We literally spent a whole afternoon there before we were kicked out, upon which quickly made plans to visit again the next morning in hope to get some more shots. It was to damn cool not to come back. Siquijor is also known as the land of magic and witchcraft, which is apparently still practiced up in the hills. Intrigued? We sure were! Thats why we decided to spend hours one afternoon on what felt like a wild goose chase, searching and asking around for this apparent witchcraft that goes on. To our disappointment we did not see anything spooky or witchy :( but we did get to meet some pretty cool kids in the street who invited us in for a game of basketball. 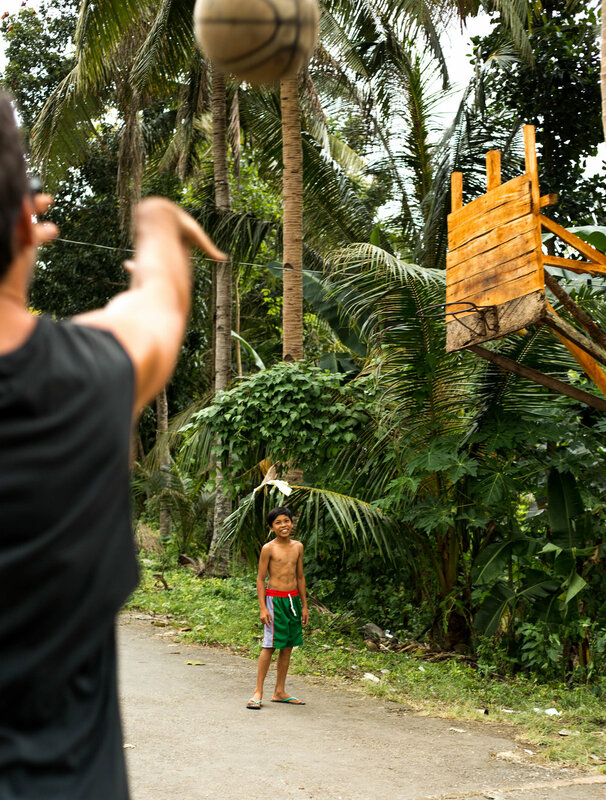 Basketball is a huge part of the kids lives in the Philippines & you will usually find a very busy basketball court on every corner. If the locals aren't playing ball they are singing karaoke together. Yep thats right! Singing and Karaoke is almost every Philippinos favourite hobby. I don't think you'll ever understand the importance of it unless you see it for yourself. The west side of the island is where you will find most the restaurants, in particular our favourite Baha Bar. This place has an exciting menu that uses ingredients grown and kept on their own farm. This place has a really cool vibe with live music most nights and an upstairs with a large deck. Check it out! Another favourite of ours was right next door to our accommodation called Pagoda verde. It is part of another resort called Casa de la Playa & specialising in vegetarian food. The wait can be a little ridiculously long but the food was super tasty and fresh. On the West side of the island you will also discover long stretches of white sand beaches. The sand and palms are the highlight though as the water is quiet swampy and not overly refreshing. Great for relaxing & sun baking though :). 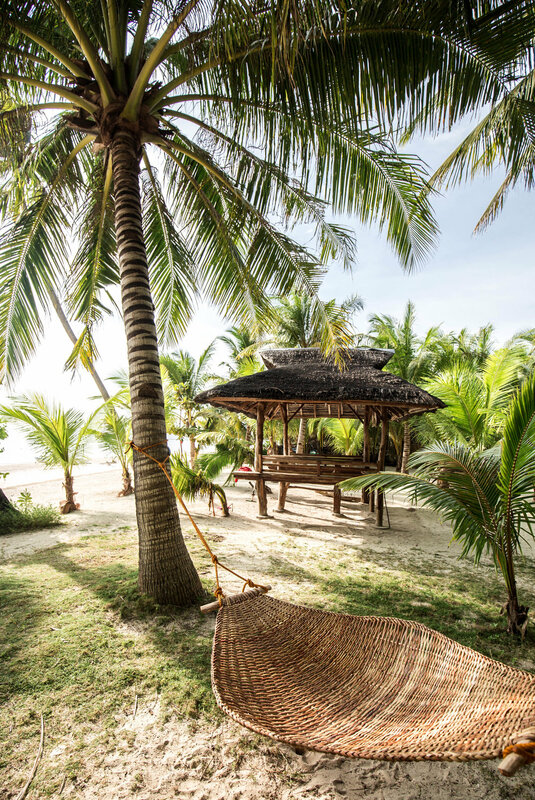 Although Siquijor wasn't our first choice in the beginning, I left feeling like I had strong connection with the island and its people. If it wasn't on your list it is now!